This weekend I began a new project that I have been wanting to start for some time now. It's a quilt for my entryway quilt hanger for the 4th of July! 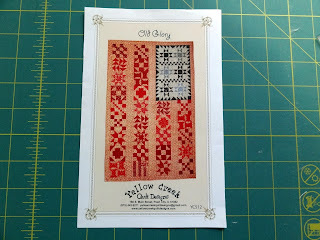 The pattern is called Old Glory from Yellow Creek Quilt Designs. My quilt will look nothing like this! 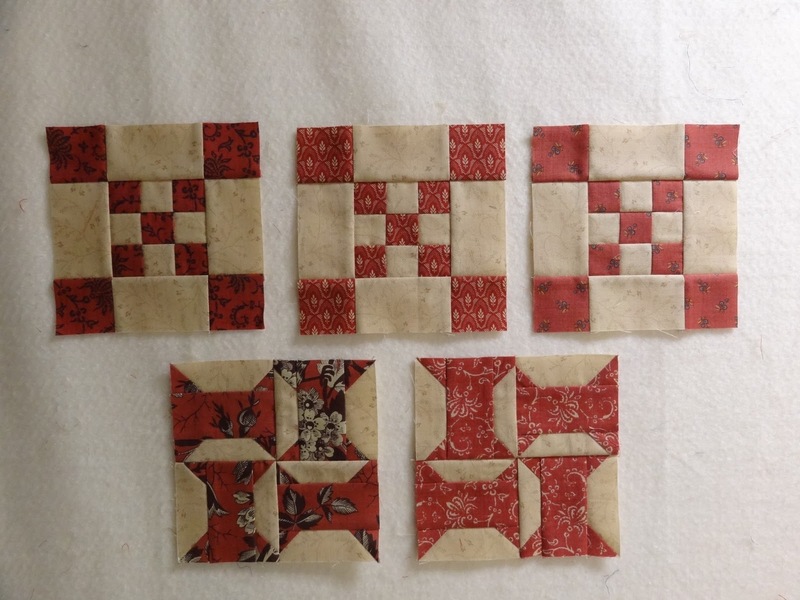 I'm using a combination of reds from French General and blues from The Morris Apprentice by Barbara Brackman. The setting fabric is French General Oyster Clochette. 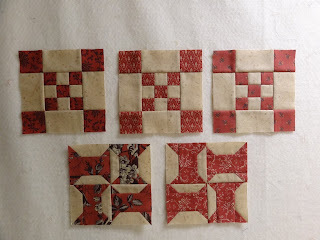 I got five blocks done over the weekend and many more to go! The setting fabric is all the same, it just looks a little darker on one side of this photo. 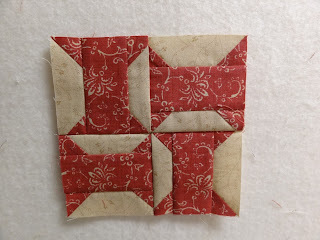 Most blocks of the red are done in 3's, but using different reds. Here is a closeup of a spools block. 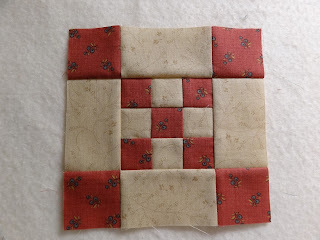 And a closeup here of the Nine in Nine Patch block. I'll continue to show you my progress along the way! 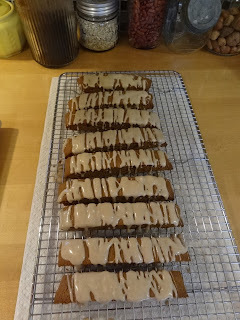 In addition to sewing I just had to try this recipe for Gingerbread Biscotti from April over at Dimples and Delights. My drizzling is a little globby in spots, but does not detract from the great taste of these delightful treats! We'll be traveling beginning tomorrow, but I'll try and have a post or two from the road. Looks to be a beautiful quilt and I like the colors as well. Can't wait to see the progress and finished quilt. That is going to be gorgeous. I love the pattern. Oh, what great choices, Candace! 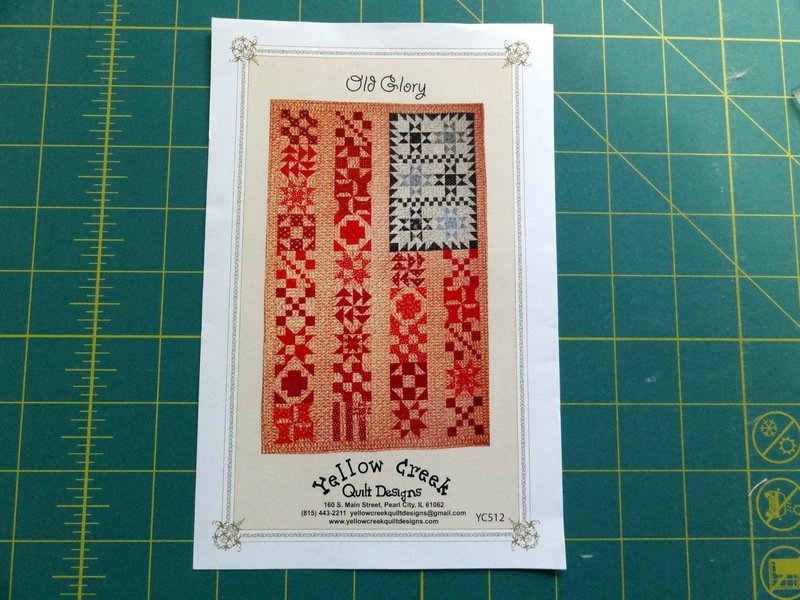 I absolutely LOVE this pattern - the girls at Yellow Creek are good customers of mine. They are so talented. I want this pattern, but keep talking myself out of it (knowing I'll probably never get to it!) but I might have to break down and get it anyway! Can't wait to see yours as it progresses. You can not go wrong with those fabrics - this is sure to be a winner! Do you have a link for this recipe? I didn't see the name of the blog on your side bar. We love gingerbread around here and I'm sure we'd love these yummy treats. You quilt is going to be beautiful by the way! I'm excited to watch your progress on it. Beautiful blocks! I love tan as a background for the rich reds and blues. O.M.G. to gingerbread biscotti! I'm drooling here. Good travels! You said CA but not where--wave to me if you are in SoCal! that is a really neat pattern. I like your reds. Ahh.. precision piecing, your forte. What size are the blocks? 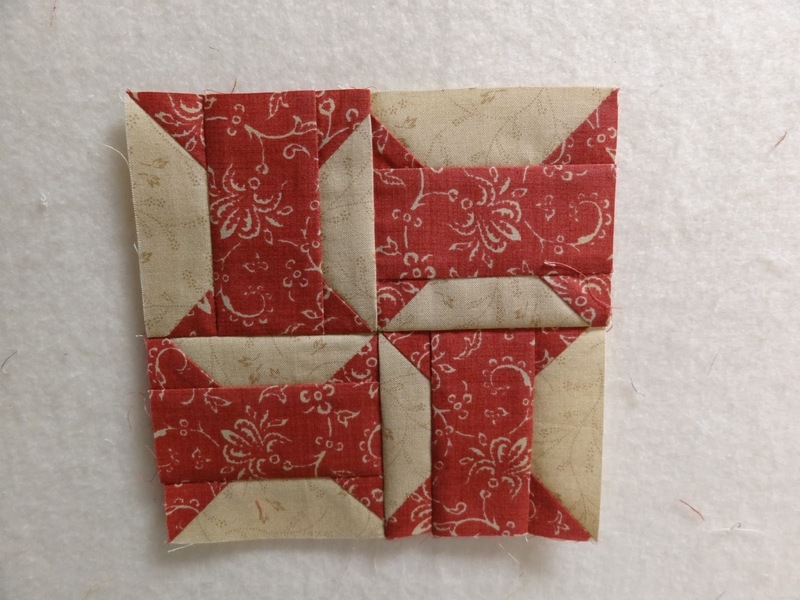 It promises to be a lovely, vintage looking quilt. Safe travels. Safe travels to you and Mr. Squash. That is going to be one amazing quilt. I'll be following your progress with envy. Oh yum, I knew I smelled a wonderful aroma! What a great NEW Project and you are making wonderful progress already :-D It will be fun to watch your progress on this one. You know how much I LOVE French general fabric. Have a Safe & Fun trip to California ! Definitely a grand old flag! Looking forward to your progress. Biscotti? Any left? From two or three quilts I have made using them. Biscotti is so easy to make...the ginger bread sounds wonderful! Geez Candace, globby is good..travel safe! It is a great feeling to start the year with a new project! Your blocks are very cute, Candace! Happy stitching and have a relaxing trip! So lovely Candace. I like French General reds too. Debonaire has them with a bone shade of cream. Great combo. Lovely piecework so far.